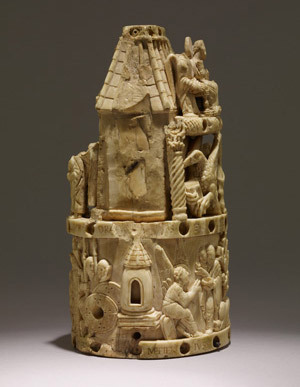 An expensive commodity, ivory was widely used in the Middle Ages for reliquaries and smaller sculptures. Its pure white color was an indication of the holy status of its contents, and the smooth, unblemished surface of ivory hinted at the incorruptibility of sacred human remains. 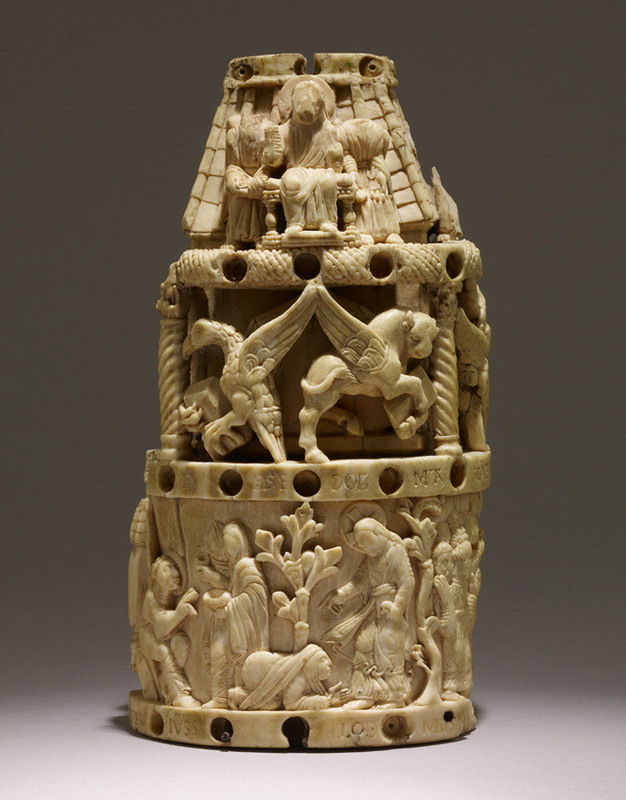 Ivory itself was considered incorruptible. This cylindrical carving is hollow, with a pyramid-shaped cavity in which relics may have been stored. A cover, now missing, would have sealed the opening on the underside. 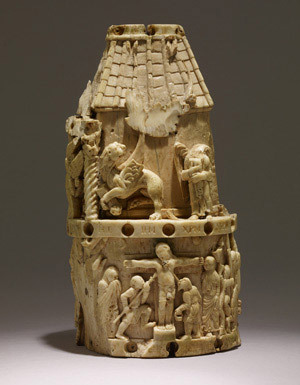 It is thought that this reliquary served as the base of a crucifix: a narrow space at the top is crossed by drilled holes that could have contained rivets to hold the tang of a cross. 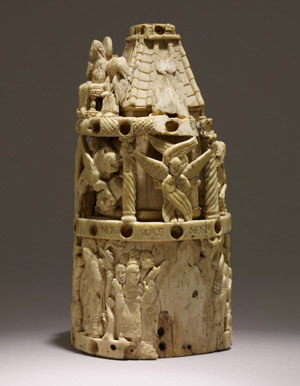 A smaller, pyramid-shaped base for a cross, decorated with beasts, in the Victoria and Albert Museum (12-1873) is a similar example. The piece is divided into three registers. The base is oval, showing the Crucifixion, the visit of the three Marys to the tomb, the Noli me tangere, and the Ascension, framed by two inscribed bands interspersed with drilled holes that likely once contained gems or pastes set in gold. The armor and weapons of the soldiers guarding the sepulcher are seen in Carolingian manuscripts, and examples of their spear heads have been excavated from the Thames. Above the base is a rectangular structure bearing a column at each corner containing figures of the Evangelists, supporting a wreath. Their symbols are shown in two of the sections between the columns: the ox, the eagle, the lion, and the man or angel. A seraph with six wings stands at one end, hands extended; another seraph would likely have been located at the other end. The top portion of the reliquary is a steep tiled roof, on one side of which Christ in Majesty is seated on a throne between two angels.